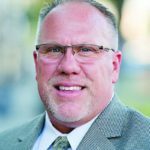 Effective June 11, 2018, Scott Braden will assume the role of CCEA President. Tony Munguia, the organization’s recently elected President, resigned his position due to unforeseen circumstances. His dedication to CCEA over the years has been significant and meaningful, with his previous tenure as as an Officer (as State Secretary) and his establishment of the new CCEA Twitter account — @CCEAeducation. Share a post or send a message to Tony anytime. Scott Braden, CCEA’s recently elected Vice President, becomes the organization’s President, by affirmation of the board. Scott is currently Principal at Citrus High School in Porterville, CA. We look forward to a smooth transition, and the continuing support of all our members and officers! We’ll begin announcing our plans for the upcoming Model School program, and the new school year soon. Update 6/21/18: per the Board’s decision, Daniel Barajas will assume the role of Vice President.